Irma has intensified to a “potentially catastrophic” Category 5 storm. The hurricane is packing winds of a whopping 185 miles per hour, making it the most powerful hurricane to form in the Atlantic Ocean since satellite observations began. Irma made landfall in the Caribbean early on Wednesday morning, passing over Barbuda and Antigua, and knocking out communication between the islands. Barbuda’s foreign affairs minister Charles Fernandez told the AP via text that the northern end of the island was hit hard, but it’s too early to assess the damage. The rest of the Caribbean is bracing for potentially “life-threatening” winds, storm surge, and rain within the next 48 hours. The worst of the storm is expected to pass over Puerto Rico and the Virgin Islands on Wednesday. The hurricane’s longer-term path remains uncertain, but the latest forecast models are increasingly putting the storm on track to hit southern Florida this weekend, as the massive cleanup from Hurricane Harvey continues in Texas. Florida governor Rick Scott declared a preemptive state of emergency on Monday afternoon as Hurricane Irma gained strength in the Atlantic and appeared likely to strike the state this weekend. On Tuesday, Scott said on Twitter that he had spoken with President Donald Trump, who promised federal-government resources as the hurricane approaches. Scott has requested the White House issue a pre-landfall emergency declaration. Additionally, the Florida governor has activated 100 National Guard troops to help with storm preparations, and has notified 7,000 guardsman to report for duty on Friday. Floridians, no strangers to hurricanes, aren’t taking any chances and are preparing for a potential thrashing by Irma. Store shelves in places like Miami were already emptied of water by Monday, with at least some businesses promising to restock Tuesday. According to the National Hurricane Center’s latest bulletin, the storm is moving west at about 14 miles per hour with maximum wind speeds of 185 mph, with some higher gusts. 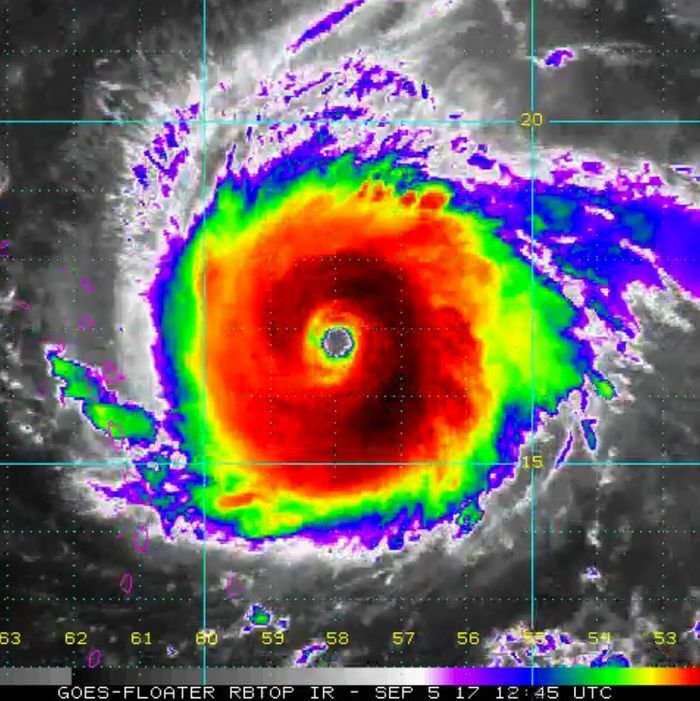 Irma is already closing in on the record for strongest hurricanes ever, and the first since 2005 (Wilma) to reach the wind threshold of 185 miles per hour. The hurricane is also tearing through extremely warm waters, meaning its wind speeds could intensify still. Irma is expected to continue on a west-northwest track, and looks to be on a collision course with population centers in the Caribbean. Hurricane warnings have been posted for Antigua, Barbuda, Anguilla, Montserrat, Saint Kitts, and Nevis, among other islands. The National Hurricane Center predicted storm surges as high as 11 feet for some of the Leeward Islands in the storm’s path, and rainfall totals between 8 and 12 inches — with some isolated spots notching over a foot of rain. The U.S. Virgin Islands and Puerto Rico are also under a hurricane warning. Puerto Rico’s governor, Ricardo Rosselló, declared a state of emergency on Monday, and activated the National Guard. U.S. Virgin Islands governor Kenneth Mapp said he submitted an emergency declaration to the White House on Tuesday. Irma could deal those U.S. territories a serious blow whether it makes a direct hit or skirts the islands. In Puerto Rico, the island’s ongoing fiscal crisis could exacerbate storm recovery. The head of Puerto Rico’s power company said if the storm knocks out electricity, parts of the island could be without power for months because of shoddy infrastructure and the ongoing budget crisis. Irma will likely veer toward Turks and Caicos, Cuba, and the Bahamas after it blows through Puerto Rico. But beyond a five-day outlook, the storm’s track is less clear. Though Irma continued to shift south and west over Labor Day weekend — ominous trends for the U.S. mainland — it may still curve out to sea eventually, though that possibility is looking less probable by the hour. Florida appears to be the most likely state to sustain a hit, or at least feel some effects from Irma, which will still likely be a Category 4 or 5 by the time it nears the peninsula, thanks to the extremely warm waters of the Caribbean. Officials there are wasting no time in warning residents that Florida could see tropical-storm conditions as early as Friday. State of emergency in Florida for #Irma means government officials are allocating resources. Residents, you need to get yourselves ready. But Irma’s uncertainty means other parts of the coastal U.S. should also be on high alert. Irma could still track closer to the Gulf Coast, or even deliver serious storm surges, winds, and heavy rain to the Carolinas. And just as Irma ratcheted up intensity Tuesday, another named storm emerged in the Atlantic: Tropical Storm Jose is not expected to threaten the U.S. mainland at this time, but could still develop into another major hurricane. If Irma does hit Florida at its current strength, it would be the state’s most powerful hurricane since Category 5 Andrew, in 1992, which caused $26.5 billion in damage and left 65 people dead — at the time, it was the costliest hurricane in U.S. history.